Olivia Voldoren Spikes from $5 to $15 in a day because of Chopin’s MTG Worlds Deck! 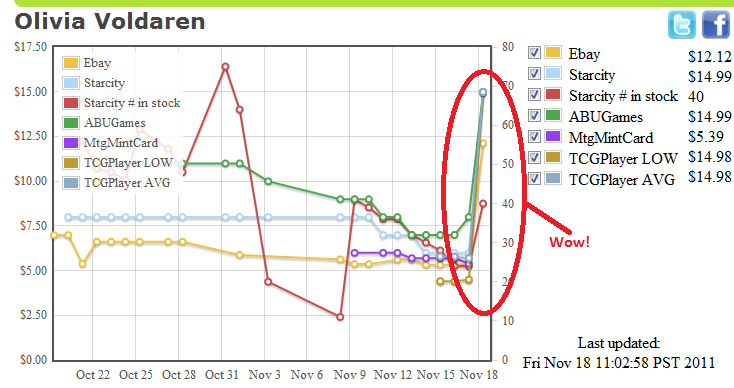 It looks like our data that was pointing to a big spike in the price of Olivia Voldoren were right – she went from being a $5 card to a $15 card in less than a day on the back of Patrick Chopin’s MTG Worlds decklist. A guide to the deck can be found here: http://www.youtube.com/watch?v=9R8FLpMTyIc&feature=player_embedded#! The beta starts on December 1st and will let users learn of upcoming shifts in the trading landscape before anyone else knows about them, allowing users to act quickly to snap up the cheapest cards before they are gone then flip them for serious profit. Planning on doing some serious trading at mtgworlds? Read this quick guide to make sure you get what you need! Our biggest trading tip is to know what you want before you start. If you’re looking to build a standard deck, make a list of exactly which cards you need and try to stick to that list while trading. Just because someone has a foil Snapcaster Mage doesn’t mean that you should trade for it if you’re looking for 4 of something else. Once you know what you are looking for, it’s important that you don’t get conned out of your best cards. At big events like worlds, almost everyone is friendly but a few are very aware of the fact that they won’t see the people they trade with again and act like sharks. It’s a good idea to use the MTGPrice.com MTG Card Search either on a laptop or (ideally) on a smartphone so you can see how much various stores charge for a given card. For more complex trades, we strongly advise using the MTG Fair Trade Wizard to automatically price cards as you add and remove them from the trade. Most prices are for “mint” cards – that’s cards that have never been played with, or only very lightly played in sleeves. If the card you are trading for isn’t mint, be sure to point this out and use it to your advantage – ask for more in return. Older cards are both valuable and easy to fake. Look carefully at any card over $20 or so in value – does it feel like a regular card? Does it bend correctly? Are the Colors looking good? Is the border correctly colored? If you’re not sure or feel uneasy, just walk away. In general, it’s better to trade several low value cards for a single high value card. High value mythics and older rares tend to hold their values for longer periods of time (and even increase) whereas lesser cards are typically forgotten when they rotate out of the current tournament block. Speaking of the current tournament block, pay attention to what is coming up in the next few months. Standard-powerhouse cards that were once worth a lot of money may be underpowered for Modern and so will see a significant price drop. Try to dump these cards and pick up similarly-prices cards from Innistrad instead. We hope this short guide helps you with your trading at mtgworlds. If you make an especially great trade, or simply want to vent, feel free to post below. tcgplayer.com support added – moving towards first beta release! Still, we’re making steady progress and met another milestone yesterday with integration of the prices from tcgplayer.com and their affiliated stores. TCGPlayer collects information from a large number of smaller stores – something that si generally harder to track and we greatly appreciate them allow us to use their data on this site. As always, if you have any comments, please let us know below! This is the second ALPHA (as in, before beta) test of MTGPrice.com and we’re pretty happy with the progress so far. Our goal is to build the world’s fastest, most accurate service for our users to get pricing information about single magic: the gathering cards. We want to allow players that trade cards regularly to quickly find the trade value of those cards to see if they are getting a fair deal. In addition, we want players to be able to track the value of their collections over time and provide tools to buy and sell entire collections of cards. To ensure our impartiality, we don’t plan on selling cards ourselves, instead we just want to show players the prices on other sites and let them make up their own mind.